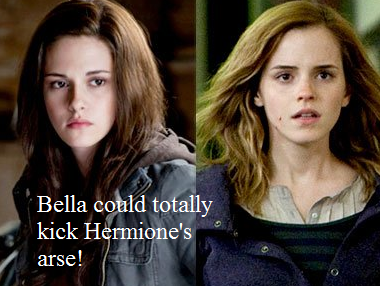 Bella could beat Hermione. Spoof confession. Wallpaper and background images in the Harry Potter vs Twilight club tagged: twilight harry potter hermione granger bella swan spoof confession. This Harry Potter vs Twilight fan art contains ritratto, headshot, primo piano, and closeup. Even as a vamp Hermione could kill her. Two words: Avada Kedavra. I rest my case. Please tell me this is a Troll. Hermione could beat her any time any day. Either this is a joke, or the person who made this is an idiot. Does Bella even know what and where an arse is??? OMG!!!!!!!!!!!!!!! THIS IS INSANITY!!!!!!!!!!!!!!!!!!!!!!!!!!!! HERMIONE IS ONE MILLION TIME BETTER THAN STUPID BELLA!!!!!!!!!!!!!!!!!!!!!!!!!!!!!!!!!!!! !